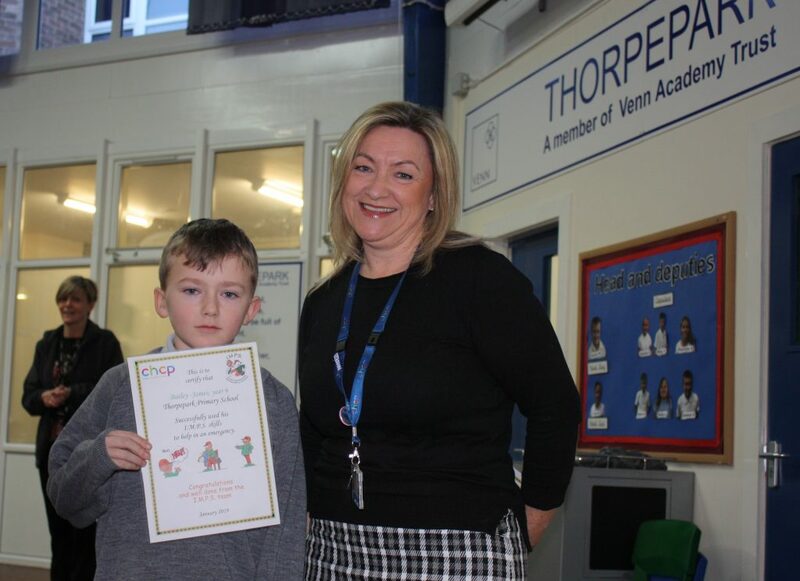 Bailey-James Watson receiving a special certificate from Donna Shipp, IMPS co-ordinator. Bailey-James Watson, 10, used First Aid training taught at school by City Health Care Partnership CIC’s IMPS (Injury Minimisation Programme in Schools) team to save his four-year-old cousin from choking. Bailey is a pupil at Thorpepark Academy in Hull and, along with the rest of his class, had the training in October 2018. Then at Christmas he was playing with his cousin and noticed something was wrong. The IMPS team have trained over 32,500 children since the project started back in 2001 and sessions are offered to all Year 6 pupils in Hull. They are taught basic first aid skills through the intensive prevention programme, which links into Key Stage Two education standards. Pupils are taught how to prevent and deal with the most common accidents that children of their age are likely to have like burns and scalds, falls, electrocution, choking, bleeding and road traffic accidents. They also learn how to perform basic life support and how to put people into the recovery position. Be the first to comment on "Hull schoolboy’s First Aid training saves cousin from choking"